“I wouldn’t be surprised if we saw a steep, sharp pullback, which will scare all the people that got in late, have a little bit of consolidation and then we start the next phase up,” said Bruce Campbell, founder of StoneCastle Investment Management Inc., which has about $150 million in assets. The Kelowna, British Columbia-based firm, together with Toronto-based Spartan Fund Management Inc., are launching the StoneCastle Cannabis Growth Fund on Friday, a month before Canada legalizes recreational weed. The actively managed fund will use technical analysis to track momentum in the sector. It will invest in cultivators as well as ancillary businesses such as retailers, delivery and testing systems and real estate. 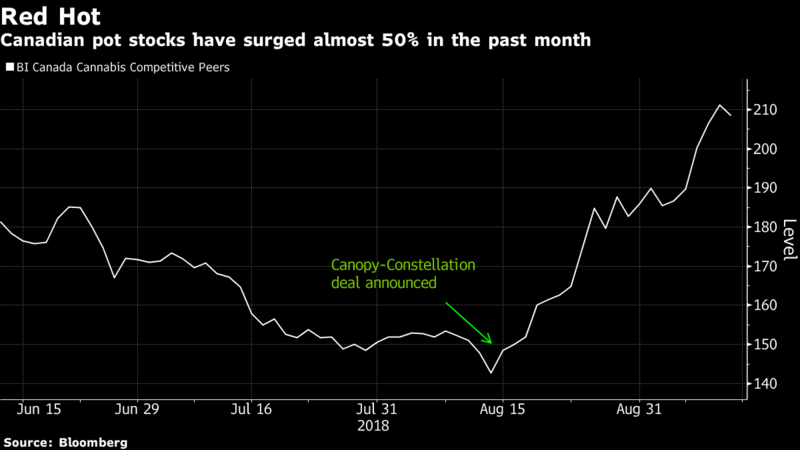 Cannabis stocks have been red hot since mid-August, when Canopy Growth Corp. announced a $5 billion investment from Constellation Brands Inc., the biggest deal in the sector to date. The BI Canada Cannabis Competitive Peers index has added nearly 50 per cent since then, while other stocks have posted even more outsized gains. Tilray Inc. has soared more than 600 per cent since its July IPO. The stock rallied as much as 21 per cent in New York Thursday, pushing its market value past $US10 billion. It has added about US$4 billion since Friday’s close alone. Campbell said he prefers smaller companies, which haven’t risen as much as their bigger peers, and is looking for a mix of Canadian and U.S. exposure. The fund’s holdings will include Valens Groworks Corp., Sunniva Inc., C21 Investments Inc., CannTrust Holdings Inc. and Organigram Holdings Inc.